When I spied a fellow author at Galactic-Con, I took the first opportunity I could to slip away from my table and introduce myself. Scott immediately launched into his elevator pitch: A detective from the 1930's finds himself on a futuristic spaceship. I love noir style detective stuff and am personally working on a space opera series, and the mash-up sounded unique and intriguing. 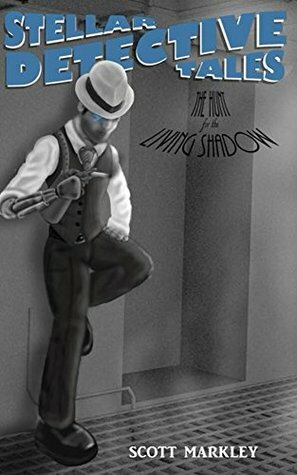 The Hunt for the Living Shadow follows Flint, a private investigator from 1930s New York City, who has somehow swapped brains through space and time with Sammy Teegs, a detective on a space ship recreation of NYC. The first half of the book feels like a superhero origin story while the second half focuses on the current mystery at hand. I'm a sucker for origin stories, so I found Flint's tale fascinating. The temporal rift which placed him in Teegs's body has given him a glowing blue eye which can selectively see events in the past. He has to use his new ability along with his investigator intuition to solve the case at hand. A lot of Flint's dialogue is steeped in speakeasy lingo which was both charming and a little distracting. The mystery itself didn't really grab me, but since I was so invested in all of the characters, I couldn't put this book down until I finished. The settings on the spaceship were intricately detailed. I could feel myself plopped in the middle of the city with the spaceship's dome encasing everything. There's a nice hook at the very end for Flint's next adventure and I'll make sure to pick it up! If you like noir, mysteries, or origin stories, you'll enjoy reading Stellar Detective Tales.